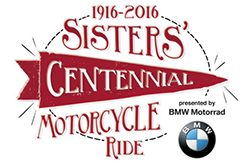 Woodcliff Lake, NJ – June 1, 2016…BMW riders who register to participate in a leg or the whole route of the upcoming Sisters’ Centennial Motorcycle Ride by June 15, will receive a free gift from the BMW Motorcycle Owners of America (MOA). The three-week cross-country motorcycle adventure for women, presented by BMW Motorrad USA, commemorates the 100th anniversary of Adeline and Augusta Van Buren’s historic motorcycle ride across the United States. In 1916 – three years before women had the right to vote – the Van Buren sisters set out on a bold journey: to prove that women could be military motorcycle couriers. Their transcontinental ride made the Van Buren sisters a brave, adventurous inspiration for young women across the nation. One hundred years later, modern women riders are following in their tire tracks with the same spirit and determination. The day rider option includes riding with the “main” group of riders, a route sheet of the day’s ride, rider support, dinner with the group and a commemorative T-Shirt. This registration option is for a maximum of three days. Riders wanting to join the event for four or more days would need to register differently. The day rider option does not include tolls, fuel, hotel rooms or entry fees to museums or other venues. Separate payment is required for those items. The extended family of the Van Buren sisters will be on the ride, including Adeline’s grandson Dan Ruderman, great-granddaughter Sofié Ruderman and great-grandson Skyler Ruderman. Nieces and nephews of the Van Burens will also be on the ride, including Robert Van Buren, great nephew of the sisters as well as his daughter Sarah Van Buren, great-great-niece of Adeline and Augusta. The ride route will follow the Van Burens’ 1916 route as closely as possible, often along the Lincoln Highway. Combining scenic routes, community events, and important stops along the Van Burens’ own journey, the route is designed to facilitate both safe and adventurous touring as well as the courage and capability of women as cross-country motorcycle riders. The BMW Motorcycle Owners of America is comprised of a network of 32,000 BMW motorcycle enthusiasts representing all 50 United States, 10 Canadian provinces, and seven continents. who started with the same spark for motorcycling that you did. Its history dates back over 40 years to five friends who formed a motorcycle club to stay in touch with each other. Membership is $40 per year and includes numerous benefits. For more information about the BMW MOA and member benefits, visit: http://www.bmwmoa.org/.